My husband and I wish to teach our children that we do everything for God’s glory and not our own. Even if it means that He will not always bless our heart’s desires. But still, there are some days where I struggle with disappointment when things or people don’t go my way. This past week was a big one of those for me. It felt like there were frustrating outcomes and let downs every way I turned. I wanted for once something to be about me and not everyone else. Things would come so close to what I expected, but then fall short; one disappointment after another. At one point, I was sitting in my car, thinking about everything that was going wrong and feeling sorry for myself. Suddenly, it was as if I heard His still, soft voice wash over me, “Daughter, you are trusting in yourself, not me. You are trying to do all this in your own strength, not mine. You are looking at others to fill a need that only I can.” And right there, with a sick, sleeping baby in the backseat and cold, NW rain pouring down all over my car, I began to sob. I asked Jesus to give me peace over all that was troubling me; that He would change my heart to seek His will, not mine, in each and every case and for the strength to not throw a pity party when it didn’t go the way I hoped. Still, even with that daily resolution, prayer and refocusing, I seem to fail again every time I am disappointed. How is it that I can know each day to trust God in the uncertainty of my life, and then the next moment when something troubling happens, I am back in the wallows of selfishness, hurt pride and sulking? Am I really practicing thankfulness each day? Am I seeking His true desires for my life over my own? How do I balance my natural, fleshly wants with what are honestly acceptable emotions to feel? Is it wrong to ask God for things that I want and for life to just go my way? I think if every Christian is honest with themselves, they wonder about these things as well. I mean, it’s not as if we are asking for those evil, fleshly desires like sexual immorality, impurity, lust, evil desires, greed, and idolatry (Colossians 3:5). Usually I am asking for stuff like safe and healthy children, a fulfilling marriage, positive fellowship with others, wisdom in decisions, a rewarding job, or a consistent paycheck. But is it possible that asking for those things can BECOME idolatry? If I am not asking with the right intentions, but rather with a prideful heart? Or perhaps just plain and simple, I’m asking for something that is not His will for me. Get a new job that my husband can feel good about himself in. No. Sell our home and move into another. No. Be successful in some new endeavor. No. Healing of broken relationships. No. The ability to overcome a nagging character flaw. No. It could be I’m asking for the wrong things or with the wrong intentions. Maybe my obsession with these things has become an idol in my life. And perhaps where we’re at right now is His will for us and I need to learn to be thankful for what we have and rely on His grace to be sufficient. When I stop and truly examine our life, I am overwhelmed with how blessed we already are. There are many, many people who dreams of what we already have. Why can’t I be happy with it as well? Why can’t we just be content with what He has already blessed us with and stop always asking for more more more?! What about the things He has already answered, emphatically “yes” to in my life? Why am I always so quick to forget those? The amazing, supportive husband I prayed for so long ago. Yes. Three beautiful, healthy children. Yes. The financial ability to stay home as a wife and mother. Yes. A stable job, a more than adequate home and lots of joyful things in our life. Yes. Yes. YES! Perhaps the lesson here is that I need to remember that He has already blessed us immensely with more than we need. If I can just change my attitude from wanting what I don’t have and crying like a baby when things don’t work out the way I hoped, to wanting what He has already given, maybe THAT is the secret to contentment. It is possible that then and only then I will be able to see the beauty in the beholden. That I will have true joy. HIS JOY. And most importantly, I will be happy with having the other things in His timing. It’s always such a pleasure when you link up to The Weekend Brew. I love reading all the stories here. When you shared you were sitting in your car just sobbing and God reminded you that He is your strength, I immediately thought of my past week and could immediately relate. God is so real and so present. We just don’t always look in the right places. Blessed by your words today. Awww, thanks, Mary! I love using my blog to be a voice for sharing other women’s stories, but it is always such a treat to be able to write my own posts every now and then. Have a blessed week and I’ll see you next! I know that God’s plan is always best for me even when I can’t understand the no’s but still need to be reminded. His grace is sufficient. I’m a really enthusiast person and get ahead of myself. I dream and fly high and build castles in the air and then fall on my stomach really hard. And the problem is that often I would run off with that dream, certain that it’s the best thing ever (again), without praying and asking God what He has prepared for me. I was spinning my gossamer web again and planning how I will go there and do this and will have an amazing life because it’ll be so amazing, when I felt God saying to me, Don’t! Don’t get ahead of yourself, don’t get excited about this, Wait! I know what I will do. It was such a defining moment to be able to let go of those plans and trust that God actually has everything in His hands, and that those hands are capable. Sometimes it’s truly about being thankful for what I have and living where I am, being there, totally. You are so right to remind us to see the Yes more than the No — and also to warn us against the slippery slope of idolatry. God always wants to be first in ALL things. Thank you for linking at #SmallWonders. Thank you for sharing your heart with us here at Tell me a Story. This was beautiful and honest and touched my heart that you would share it. Thank you. I can identify so much with what you wrote here. I am a dreamer and also a forgetter of blessings when things get frustrating. And unanswered prayers have, at times, threatened to break my heart. But one way that I have started to pray through it is to ask God to conform my will to His. I ask Him to let me start desiring what it is that He desires for me. I pray that our wills can be perfectly united. It has given me some comfort and relief. Thank you so much for your post! We are neighbors on Testimony Tuesday, and I’m glad to have found you! I’ve often heard that God’s answers are yes, no or wait. Sometimes a no is really a not yet. Sometimes He wants our focus to shift off of asking Him for the thing, and onto Himself. All of these I’m still learning right along with you. Happy to be your neighbor at Thought Provoking Thursday. Such beautiful thoughts. I’m sure many of us have felt bad after not receiving what seems like a righteous desire, but you are right. It isn’t all about what we think is right for us, but what God knows is. I love this! “Thy will be done” is so important… but sometimes as we long for things we forget to be thankful for what we have. Yes or no… I can be assured that God has my best interests in mind. I saw your link on Friday Favorites and had to stop by. I love this post, it spoke to me and how I felt growing up. I come from a family of divorce, I am lucky that there is no fighting between my parents. Though I know there are hurt feelings, my father had cheated on my mother and that broke their relationship. I was 6 then. It took me until I was 13 to realize that my step-mother was the reason for their divorce, my mother confirmed this for me when I confronted her about my realization. She was no longer bitter at that time, things had moved on in her life. However, I realized just why I always felt a distance between my stepmother and I. It’s still there at 34, but not in the same way, we just never got along after that. Then, there was my step-father, though he and my mother never married they were together for over 3 years and it was her longest relationship since my dad. Two things came out of those relationships that I will always be thankful for, a wonderful brother and a beautiful sister. I was not able to see this until years and years later. However, I would not have my baby brother (from my dad and step-mother) or my baby sister (from my mom and step-father) if things had not turned out they way they did. God also granted me my middle sister, we share both parents. Also, if things had not gone the way they did, would I still have met my husband? Would I still have my two beautifully amazing daughters? Probably not, because my life would not have taken the road that it did. Only God knows where we are going, and he knows what we can handle. Faith is a road of trust, but it is also a hard road. Without all the hurt, the good would not feel so awesome. God gives us the bad sometimes, so we can appreciate the good even more. At least, that is how I have grown to see things. I love who I am today, and my past has made me the way that I am. I am what God wants me to be, or at least I try to be. I hope that I do him proud, though it took me a long time to learn these lessons. What a testimony, Nikki! Sounds like God is fashioning something beautiful out of your story to use for His glory. If you ever want to share more, I would love to help you write it and feature it here. Give me an email if you are interested wynterkaiser@gmail.com. May God bless you and your family! What a beautiful post Wynter. 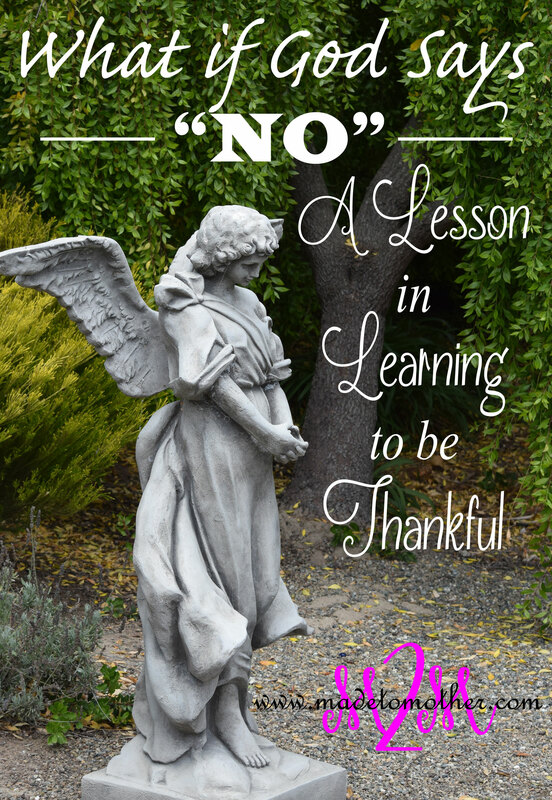 I have been there so many times, and I think that we often need to think about why God says no. Maybe it isn’t our time, maybe He has something better for us, or maybe he knows what we can handle, and it isn’t YES. I always believed that God knows what we can handle, and gives us the challenges we face knowing this. However, I never thought of him not giving something to us and saying “no” because he knows what we can not handle as well. Thank you for that, it actually had me feeling better today and I needed that. I’m so glad you mentioned that, Nikki, because I firmly believe that God often DOES allow us to experience more than we can handle. However it is never more than HE can handle and I truly believe that it is in the recognition of our weakness that we learn to lean more on His strength. Blessing to you and thank you for reading! A lot. When I find myself overwhelmed and anxious in my life I almost always realize I have taken ny focus off Christ and “leaned not my own understanding”. Thank you for reminding me of all the yes’ s to be thankful for! Great post! I’ll be sharing it this week at Happy and Blessed Home’s Family Fun Friday! A thankful heart is powerful!!!! I love your post. I’m new to your blog and I’m excited to follow along and share. It is hard to put our wants to the side and wait. Its harder to realize that my wants will not be answered. The amazing thing about God, He eventually makes some things clear on why He did not say yes. And that is when I realize that His ways are so much better then my ways. Thank You for sharing and being transparent!!!! We really do grow together as moms in an authentic community where writers and readers care about each other. I look forward to meeting everyone and reading your stories. Being a Mom is indeed a ministry!!! A blessing and challenge. Our children sure do change us don’t they. Thanks for your kind words, Lisa, and for your readership! If you ever want to share your own mama story or guest post here, please email me at wynterkaiser@gmail.com for more details!